(Bloomberg) -- Nomura Holdings Inc. is embarking on yet another sweeping overhaul of its international business, as it cuts $1 billion of costs and fires dozens of employees in its struggling global trading operations. 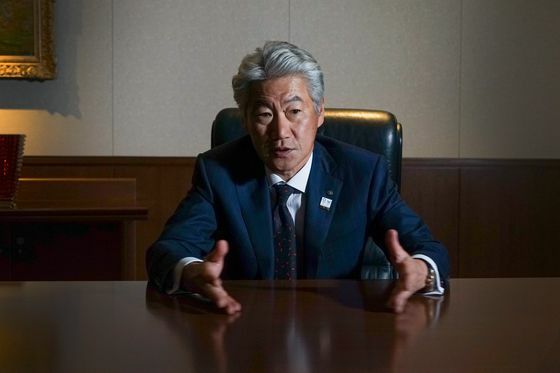 Japan’s largest securities firm will cull about 150 jobs across the Americas and Europe, the Middle East and Africa on top of reductions in Hong Kong and Singapore as part of the overhaul, people with knowledge of the matter said. Nomura executives told investors they intend to shrink the bank’s presence in dicier trading businesses overseas in favor of “risk-light” transactions for clients. 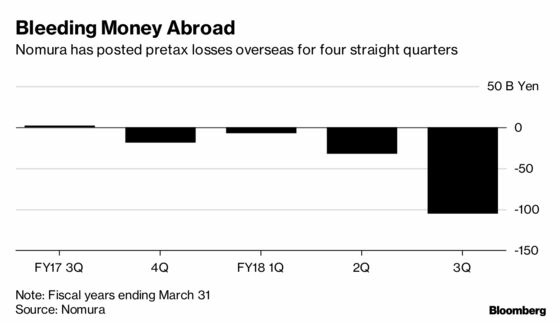 Nomura’s operations outside Japan have lost money for four straight quarters, buffeted by its stop-start international expansions as well as headwinds in Europe. Low interest rates, sluggish economies and fierce competition from the U.S. have left rivals including UBS Group AG, BNP Paribas SA and Deutsche Bank AG confronting weak results, senior departures and even merger talks in the region. The move got a muted reaction from shareholders, with the shares climbing 0.7 percent at 10:04 a.m. in Tokyo on Friday. Nomura has barely risen this year after sliding 37 percent in 2018. In Europe, the Tokyo-based bank has struggled to generate profits ever since it bought Lehman Brothers Holdings Inc.’s operations there in 2008. The bank’s job cuts there will mostly target rates and credit traders in London, one of the people said, asking not to be identified as the numbers aren’t public. optimizing cash equities including by consolidating its Instinet electronic trading platform in Asia. Most of the wholesale cost cuts will be completed by March 2020, Nomura said in the announcement, which came after trading closed in Tokyo Thursday. The company also said it will eliminate at least 30 of its 156 retail brokerage branches dotted across Japan. Nagai commissioned the review in January after the bank posted its biggest quarterly loss since the global financial crisis, thanks partly to a goodwill writedown on its 2008 acquisition of Lehman Brothers assets -- the deal that hobbled the bank’s European operations. External pressures are also at play. In fixed income, “there’s heavy competition from U.S. banks in Europe,” said Meziane Lasfer, professor of finance at Cass Business School in London. A smaller player such as Nomura “that doesn’t have the scale, can’t invest so it’s better to come out of the market,” he said. Credit rating companies have been keenly anticipating Nomura’s latest revival attempt. S&P Global Ratings said in February that it may consider reviewing the firm’s debt ratings if its restructuring efforts are unsuccessful and earnings power remains weak. Moody’s Investors Service said in November that it may downgrade the rating if the bank can’t improve profitability without adding risk to its balance sheet. Click here to view the piece. Nomura also said it will simplify its corporate structure by reducing the number of functions by half. Excluding the internal audit team, Nomura has 10 corporate areas ranging from finance to risk management and compliance. These will be streamlined into five to avoid duplication and reduce costs.